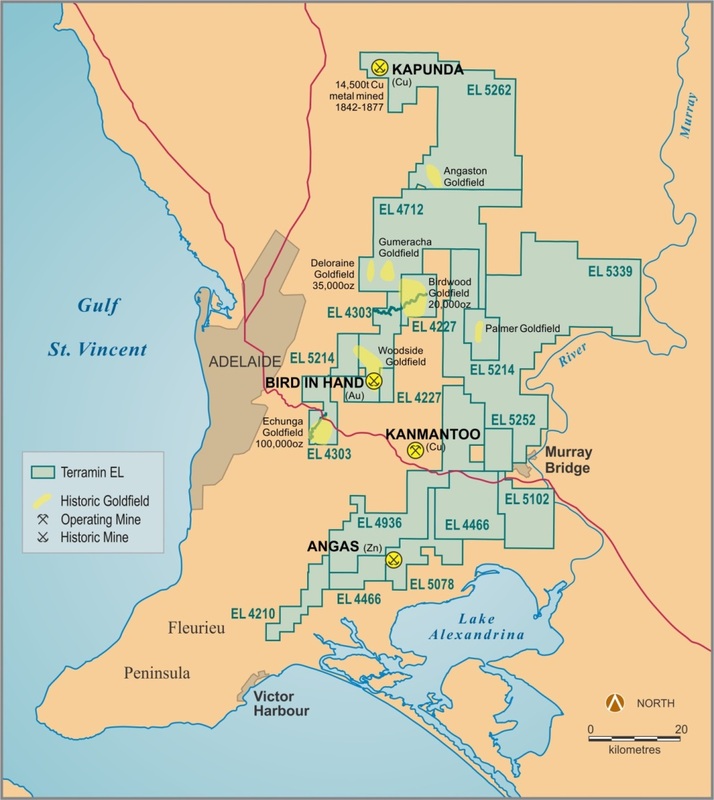 Terramin holds twelve contiguous exploration tenements comprising the Adelaide Hills Project which cover 3702 km2 stretching 120km between Victor Harbor and Kapunda (Figure 1). The recently acquired Adelaide Hills tenements and the former Fleurieu Project’s exploration tenements, are now collectively referred to as the Adelaide Hills Project. This Project area is considered prospective for gold, copper, lead and zinc. Priority focus is to find additional sources of ore that can be transported to the Angas Zinc Project and be compatibly blended with the Bird-in-Hand ore.
As part of the ongoing compilation of historical exploration and mining data to assist in the ranking of over 250 historic gold and copper mines, reconnaissance sampling has commenced at several localities including at Golden Slope, Wheal Barton and the iconic Kapunda Copper Mine. Figure 1: Adelaide Hills Project.